The following list shares shopping areas as well as our favorite Hawaii products that you can buy online. With many talented entrepreneurs living on Maui, it’s important to support our resident creators by shopping locally the next time you find yourself on The Valley Isle. An excellent place to find deals on clothing, jewelry, island-inspired souvenirs, handmade food and beverage items and arts & crafts, we recommend browsing the boutique shops and local vendor stalls at shopping hotspots like Azeka Shopping Center, Kihei Kalama Village and Rainbow Mall in Kihei. Stores like Hawaii Gift & Craft, Aloha Boards LLC, Maui World Gallery, The Maui Quilt Shop, Mahina, Aloha Skateboards and the All Good Things Maui mobile boutique, among others, round out some of our top recommendations for shopping in Kihei. 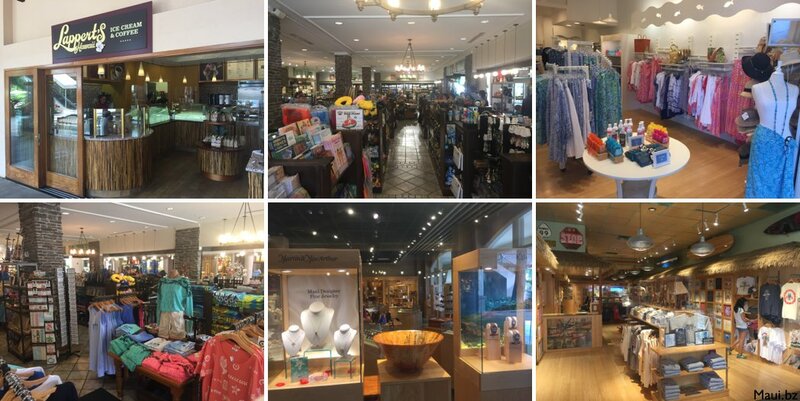 A little further south in Wailea, The Shops at Wailea offer everything from designer clothing to locally-distilled liquor and craft beer, while Whalers General Store is ideal for stocking up on smaller souvenirs. The Market by Capische, located just beneath Monkeypod Restaurant, is also a great shopping destination for handcrafted buys like BodyHI cold process soaps and bath bombs, as well as specialty food items. Spanning from Olowalu to Kapalua, you’d be hard pressed to come up with an item you can’t find in west Maui shopping hotspots like Lahaina Town and Kapalua. For a one-stop shop, the Outlets of Maui, Old Lahaina Center, Lahaina Cannery Mall, Lahaina Gateway and Whalers Village are recommended, though Lahaina’s famed Front Street has an endless supply of boutique stores for everything else, from gallery photo prints to swimwear, wood carvings, handcrafted ukuleles and locally-roasted coffee. 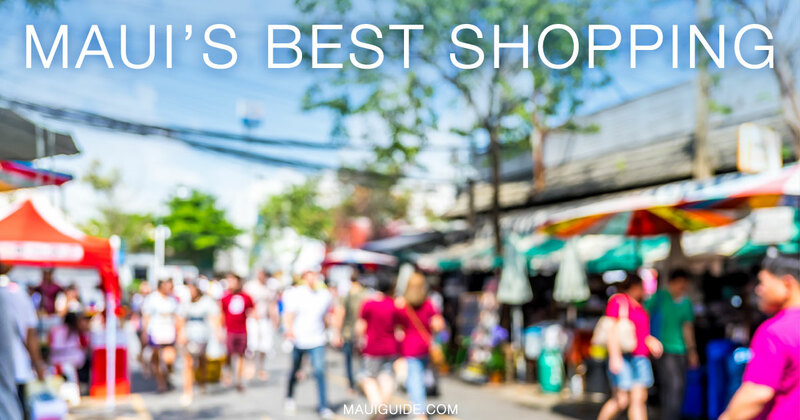 Shops like Maui Mike’s Beach House, Banana Wind, Maui Waterwear, Mauigrown Coffee Co Store, Surf Ripper, Lahaina Outlet Store, My Flower Shop, Lahaina Music, Lahaina Printsellers, Sand People, Take Home Maui Inc, Chloe Beach Boutique and plenty more are fabulous places to start. Though often overlooked for its shopping opportunities outside the Queen Ka’ahumanu Shopping Center, Kahului Shopping Center, Maui Mall, Akaku Center and Maui Marketplace in Kahului, there are plenty of centrally-located shops worth checking out on your next shopping venture around central Maui. Stop by Maui Tropical Plantation’s Plantation Store, Soley Aloha Boutique + Gallery, Rebecca Lowell Art Gallery or Mill House Roasting Co. to stock up on Maui made goodies, or head to historic Wailuku Town for shopping musts like Request Music, Maui Thing, Native Intelligence, Myndi’s Finer Things Bridal Boutique, Art on Market, Mele Ukulele and Maui Custom T-Shirts Inc., to name a few. 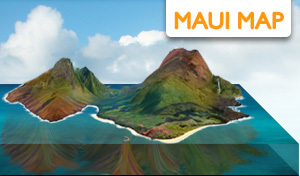 Maui.Coffee isn't selling quite yet, but you can sign up for their updates and get a chance to win some free Maui coffee! While you won’t find much in the way of massive shopping malls in this region, that’s the way we prefer to keep it. 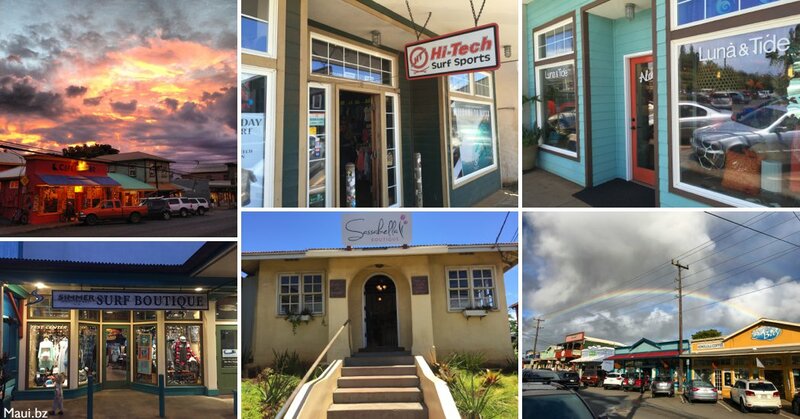 Filled with charming boutique shops, art galleries, jewelry shops and funky gift stores, Paia and Haiku bring a little edge to your shopping finds, assuming that’s what you’re aiming for. Paia gems like Alice in Hulaland, Nuage Bleu, Biasa Rose, Sun Days Hawaii, Kuau Store, Sand & Sea Maui Gifts, Oceania Maui Paia, Letarte Maui, Aquadelics Swimwear at Jammin on Maui, Lost on Maui, By the Bay and Aloha Bead Co. are some of the most popular shops, though you’ll find plenty to stop in on your short walk through Paia Town. 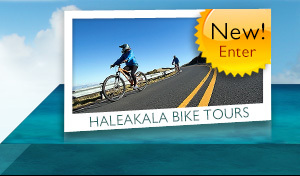 Just a little further north along the coast, Haiku’s Pauwela Cannery offers a bit of shopping assortment, along with shops like The Lucky Honey, Hangloose Hammocks Hawaii LLC, Jaws Country Store, Pacifica Island Art Inc. and Quatro International. To say the shopping options on the remote east end of Maui are limited may be a bit of an understatement, but then again, chances are you didn’t drive the 600+ turn Road to Hana through stunning Maui rainforest just to find your next pair of pants. For shopping in Hana Town and nearby, we recommend the I Love Hana Art Boutique, Terry the Weaver, Caroline’s Handmade Jewelry, Hana Maui Creations, Hasegawa General Store Inc, and if making the drive around the back side, stop and talk story at Kaupo General Store. Home to an assortment of fascinating local art galleries, Hali’imaile Distilling Company, Hawaii Sea Spirits Distillery, Maui Wine and several farms worth a visit in their own right, some of our top recommended Upcountry Maui shopping spots include Ulupalakua Ranch Store, Kula Market Place and the Ali’i Kula Lavender Farm Gift Shop. Alternately, you can do some clothing and accessories shopping at Makawao boutiques like Driftwood, Pink by Nature, Holiday & Co Maui, Fleur De Lei, Altitude Boutique, Hurricane Limited, Homme by Nature, Little Tibet Inc, Droplets and more, while unique gifts from Hot Island Glass, Dragon’s Den Herb Shop Maui, Volcano Spice Co. Store, Antique Boutique Maui, Maui Sun Tea and Worcester Glassworks will surely leave you with some memorable Maui goodies. 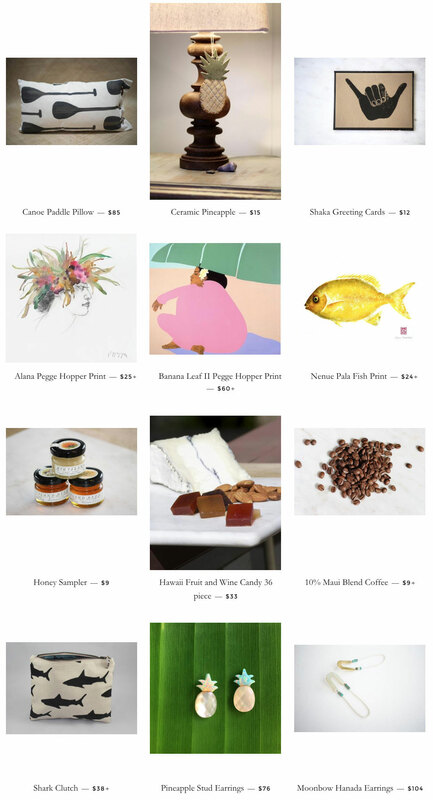 Our favorite spot online to shop is at Hawaii Made, where you'll find a curated selection of Hawaii-made products. These are truly authentic Hawaii (and mostly Maui) made items. Spread the Aloha with some quality gifts with heart.